When I was a girl, I used to tell scary stories to my younger brothers and sisters. I made a lot of the stories up, just for the pleasure of scaring them. But it never occurred to me to tell them a Cucuy story because Cucuy was real, out there somewhere. 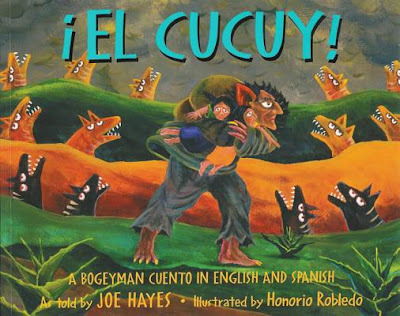 Our parents would warn us of the Cucuy to frighten us into good behavior when we were misbehaving or about to misbehave: “If you’re bad, the Cucuy will come for you.” The Cucuy was also lurking in the dark, waiting to grab us up, so we would not want to be out alone at night or wander too far away from our parents. The lesson was that it’s dangerous out there—you’d better behave or else! This is not the purpose of a scary story. Scary stories, such as that of the Cucuy or bogeyman, frighten children into behaving. They don’t get a second chance. They don’t get to meditate on the error of their ways. There’s no time for remorse! They’re gone! That’s it! The Spanish translation is idiomatic and poetic and very nicely done. For instance, while the English reads, “The boy put the girls on his burro and started down the winding path to the valley,” the Spanish reads, “El muchacho acomodó a las niñas en el burro y se fue rumbo al valle por la vereda retorcida.” Here, you can see the goatherd assisting the girls and helping them down the seriously winding path. Robledo’s stylized acrylic illustrations, on a bright palette with background shading, aptly convey the terror of the grotesque Cucuy. Unfortunately, his other characters’ faces—also with bugged-out eyes and weird grimaces—are scary as well. Besides the girls’ father actually giving them over to the Cucuy, my problem with Hays’ story is its artificially happy ending, done to “soften” the story. But many of our children hear and experience many scary stories—such as the threat of La Migra (ICE), a modern-day Cucuy that has nothing to do with bad behavior, but that often separates parents from their children. Scary stories are certainly not therapy, but they can give children an opportunity to talk with trusted adults and process their fears. As it stands, ¡El Cucuy! A Bogeyman Cuento in English and Spanish is not recommended.